I used to think of bagels as a treat, an indulgence from a bakery that I wouldn’t dream of making at home. Okay, I still think of Zingerman’s “Enough Already” bagels that way, but in general, I’ve learned that it’s pretty easy to make bagels at home. I also pack them full of greens, so I rationalize that they are a little bit healthy and not a complete indulgence! 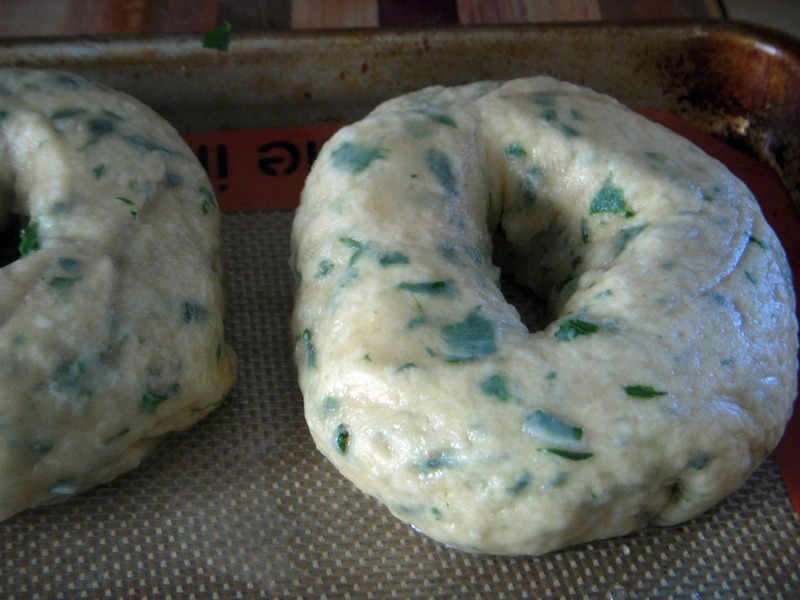 I love have cake, will travel‘s recipe for Kale Bagels. 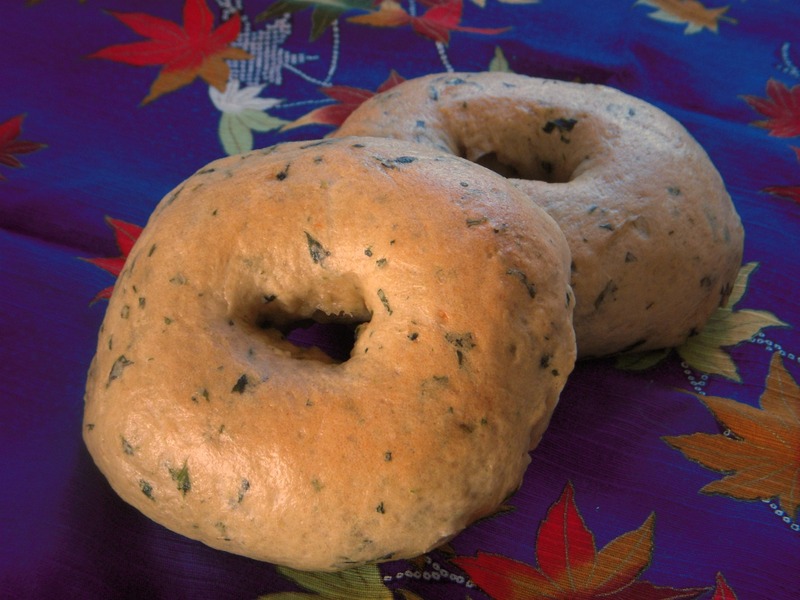 It is a super forgiving recipe, and the bagels always turn out perfectly, no matter what combination of greens I pack in them, or how I flavor the greens. This time I used a mix of spinach and kale, and cooked them according to the recipe. The blend of nutritional yeast, tamari, olive oil, garlic, and tahini results in such a tasty sauce on the greens, I’m always tempted to gobble them up as a side dish… Don’t do that though! You need the greens for your bagels! Once you’ve blended the greens with some warm water, made your dough and let it rise, it’s time for the fun part! 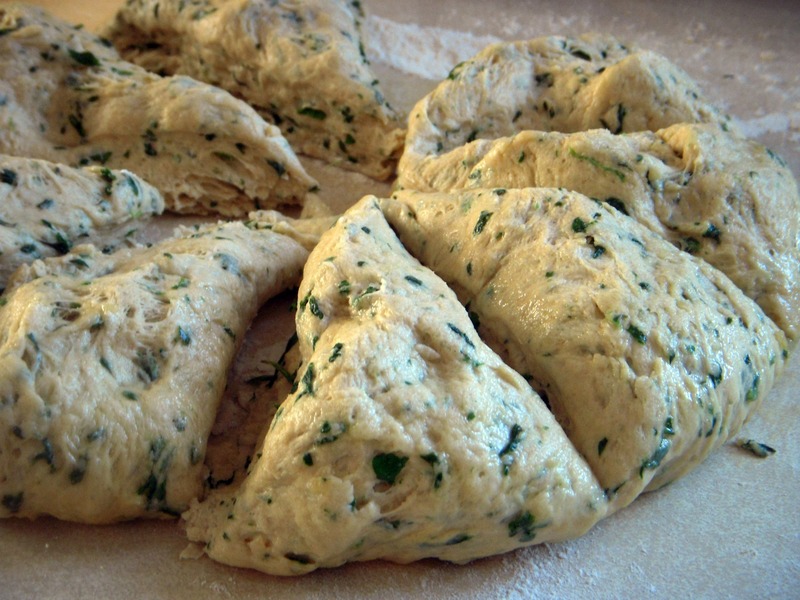 Divide your dough into eight equal pieces. 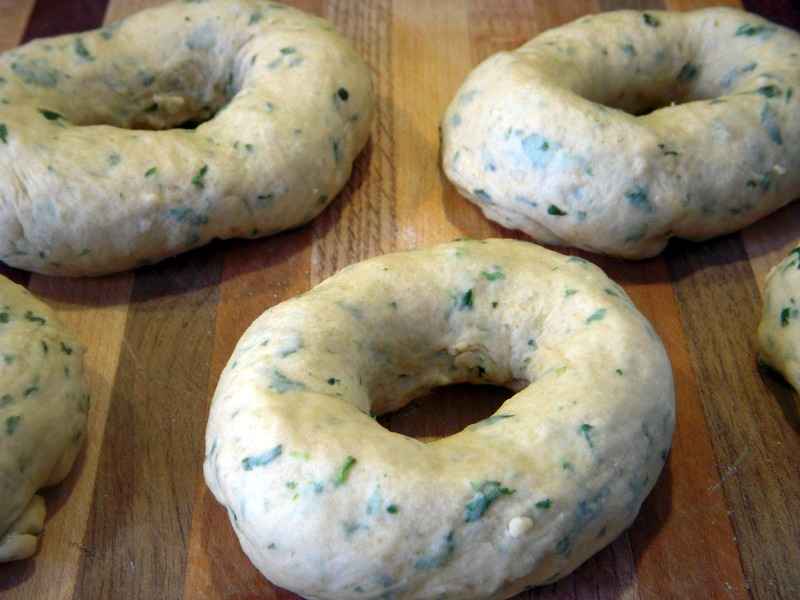 Roll each piece into a ball and form the bagel by sticking your thumb through the dough ball. Stretch and twist the dough until the hole is an inch or so wide. Let the bagels rest and rise again for 15 minutes or so. Then start some water boiling (you can add baking soda or salt to the water, but I’ve never found it necessary) in a wide shallow pan, and boil the bagels in batches for 30 to 60 seconds per side. Remove the bagels from the water, place on baking sheet, and bake at 400ºF until your bagels are golden brown and sound hollow when you tap the bottom. This generally takes about 20 to 25 minutes. Now enjoy your bagels! I’m partial to a warm bagel straight out of the oven slathered with cream cheese, but I also recommend a bagel breakfast sandwich with a fried egg and melted cheddar cheese. What’s your favorite way to eat a bagel? This entry was posted in In the Kitchen (recipes & more) and tagged bagels, brines farm, greens, homemade bagels, kale, lindsay jean hard, Real Time Farms, spinach. Bookmark the permalink. 2 Responses to Have You Tried: Making Bagels? So happy to hear that Annie, thanks for sharing your success story!